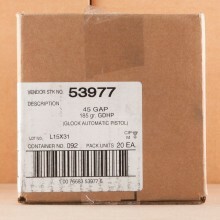 45 GAP AMMO IN BULK SHIPS FREE! 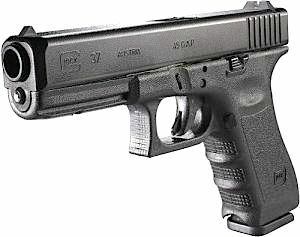 45 GAP ammunition was especially designed for Glock and "GAP" actually stands for "Glock Automatic Pistol". Engineer Ernest Durham designed the 45 GAP round as a cartridge that would be as powerful as 45 ACP but would have a stronger case head to reduce the chance that the case's neck would blowout. 45 GAP is also more compact, making it an ideal choice for shooters looking for a very strong cartridge that can still be easily concealed. .45 GAP, or .45 Glock Automatic Pistol ammunition is the same diameter of the .45 ACP round but slightly shorter and uses a small pistol primer instead of a large pistol primer. Designed for use in the full size Glock 37 pistol (pictured at right), 45 GAP cartridges caughton and eventually were proceeded by two more popular Glock pistols, the Glock 38 and the Glock 39. The GAP chamber in the firearms allows these pistols to be more narrow than their 45 ACP counterparts, which is ideal for shooters seeking a self-defense load and corresponding firearm. Look for 45 GAP cartridges for sale with bullets ranging from 185 grain to 230 grain along with muzzle velocities that are generally around 950 feet per second on the heavier/slow end and 1150 feet per second on the lighter/fast end of the spectrum. If you’re carrying 45 GAP for self-defense, be sure to look for a jacketed hollow point projectile (JHP) as these rounds have a bullet that will expand on impact. For range shooters, you should be just fine with a full metal jacket (FMJ) round. While not as common as the automatic colt pistol 45 round, there are a number of police and government agencies that have adopted 45 GAP. Namely, the New York State Police, Florida Highway Patrol, South Carolina Highway Patrol and Georgia State Patrol rely on the round. 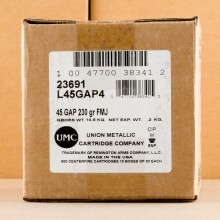 AmmoMan.com traditionally carries 45 GAP ammo in stock from trusted manufacturers like CCI (Gold Dot), Magtech and Remington so you get rounds you can rely on when you need them.